No not to me!! But to Robin Lane!! Happy Birthday Robin!! This is her birthday and her big day! So this blog hop is in honor of her special day!! YAY! Robin is the first stop on this Birthday Blog Hop. Our Birthday Girl is giving away some awesome blog candy to one lucky hopper. A complete Smash Book Kit to start off the New Year right! I have several December Birthdays and early January Birthdays to celebrate in my life as well. My mom, my mother in law, and one of my closest friends!! So I thought this card and matching candle would be the perfect gift for one of them. Thanks for inspiring me to create them Robin! And Happy Birthday again!! This card is a file from the silhouette store. I adjusted the design to fit the candle as well. The fun ribbon is Fun Footz from Lovebug Creations. Up next is Tammy! Can't wait to see what she has in store!! 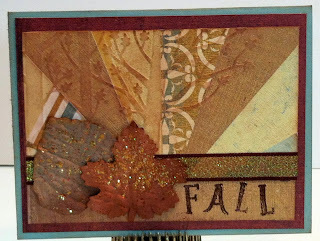 Connie here with a new project to share using Rumple Ribbon!! Did you get your cards mailed out yet? Today I want to share one of mine featuring Simply Black Rumple Ribbon. From my family to yours We Wish you a Very Merry Christmas!! And this Christmas Card featurs this cutie patootie file from Kadoodle Bugs Designs. I have been waiting to use my Silhouette to cut out this skunk and am I glad I did! It cuts like butter! My Sentiment is from a Close to my Heart Stamp. The glittery ornaments were created with special Silhouette adhesive paper and Silhouette glitter. Don't forget to enter my challenge this month, We "washi" you a Merry Christmas! My awesome sponsor is My Craft Spot!! "Just finished the hop and love all the amazing projects. I comment and follow all the blogs except Julie's blog. It wouldn't let me comment but I already follow her blog. Have a great weekend!." "Love your layouts - the Santa is so cute. Finished the hop and followed everyone but on Julie's blog, although I tried numerous times to comment, one of 2 things would happen - 1. my internet explorer would stop working or 2. after I clicked publish, nothing would happen. For some reason, my computer thinks there is a problem with the link to her blog - oh well, I tried. Following you with bloglovin'." Ladies please send me a message with your contact info so Theresa and I can get your prizes out to you!! Thank you so much to everyone for making this blog hop such a grand success!! It's reveal day for our Secret Santa Swap at LoveBug Creations. Well sort of, kind of! LOL! I get to reveal my handmade goodie but not who is on the receiving end. It's been really- really hard keeping this secret for the past month and a half. I used a file from the Silhouette store to create this cute Santa treat bag. I love Santa Claus!! He is just so cute!! So hopefully my secret santa will love him too along with all the other yummy treats being sent her way soon! Did you notice the gorgeous Christmas Grunge Rumple Ribbon? It rocks!! And makes his hat looks amazing!! I also used a fun Rudolph Skittle for his nose. Connie Can Crop (that's ME!) is the first stop on this Jolly Blog Hop. This is a one day blog hop and we appreciate your leaving a comment for all of Santa's Helpers who are here sharing their ideas and creations. I have been waiting for the perfect paper to scrapbook this photo! And I finally found it!! This was several Christmases ago when I took the kids to visit Santa at Disneyland. I really don't remember what Santa said to me at that time but I do remember it was something quite naughty! LOL! Which would explain the look on his face and mine!! LOL! I hope you enjoy this layout as much as I enjoyed making it!! Ho Ho Ho!!! Also based this layout loosely on a layout in their idea book. My title is from the Silhouette Store. I used black cardstock misted with Marshmallow Glimmer Mist. Santa was cut with Silhouette from PPBN Designs. Isn't he the cutest? And of course his bag is completed with Rumple Ribbon in Simply Black from LoveBug Creations. Also used some silk poinsettia flowers, a silver snowflake brad, and Candi (from the Scrapbook Queen's Royal Shoppe). Up next is Georgiana! Can't wait to see what she has in store!! Lately I have become addicted to Kiwi Lane Design Templates. They are just the coolest ever for scrapbooking, especially when you need some help coming with a design. I have quite a few of them and I just could not figure out what to do with them or how to store them. So after much trial and error and some serious thought I came up with this!!! I took a wire clothes hanger and wrapped patterned duct tape around all its edges. I turned the top facing inward so it could hang off a chair or the back of my scrap cart. I added lots of Rumple Ribbon to separate the different sets of patterns. I also used Rumple Ribbon knotted on the inside of my large flower. And whala! I love it! Now I just take whatever pattern I want off and when I am done I hang it back up. They never get lost or bent! 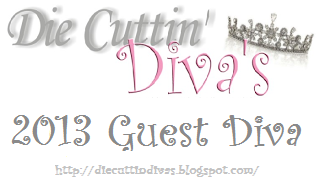 I am super duper excited to share that I am a guest diva!! Here is my tag created just for today! My tag is a diecut from the Silhouette library. And the Santa SVG comes from ppbn designs. Be sure to stop by their blog to see all the amazing projects the design team created! I will be entering this over at the Silhouette Challenges blog. I am loving my Silhouette and having so much fun squeezing in a project in between study sessions for the end of this semester. I have seen so many of the talented ladies in one of my Facebook groups creating all kind of cute Christmas things with vinyl and one thing that really caught my eye was the Santa Plates. I purchased a really cute file from the Silhouette store that was made just for Santa and his night time snack of cookies and milk. I just love this! I think I need to make a few more for gifts!! The glittery vinyl really makes it sparkle! I will be entering this over at the Silhouette Challenges blog. Not sure if counts for 3D but why not! I am just so excited I can actually play along with them now. It's Winner time!! Time to announce my big winner for the November monthly Challenge!! Special thanks to all the amazing ladies that entered this month! I have had the most entries ever and that made it so exciting for me! Your projects were all incredible! Thank you! Alicia this is gorgeous!! Congrats! I am so happy for you! You win a shabby chic kit from Angela Holt Designs!! I can not Believe December is here!! OMG!! Love this Holiday Season because I love giving! And I love the music and the decorations! I could really do with out the hustle and bustle and crowds though!! So let's focus on the positive! I want you to create a project featuring WASHI TAPE. Any kind, any brand. Just be sure to use at least one kind of washi tape on your project! Entries are due by Tuesday, December 31st at 11:59 pm. I will draw one lucky winner from all entries and they will receive a stamp set of their picking from My Craft Spot. You need to link your project up below using Mr. Linky. You have until midnight December 31st to link it up.